Sometimes, the mood takes me, and I knit. A lot. And I can finish a pair of socks in a very short amount of time. This was one of those times! I started these socks for the indigodragonwedding…Kim and Ron of indigodragonfly got married last September and the wedding invite specifically said, “Knitting encouraged!” So I located a long-stashed skein of MCN Sock (later rebranded as Mergoat Sock) and cast these on, two cuffs on two needles, and off I went. I knit exactly one 11-row repeat and laid the project down…to this day, I have no idea why. 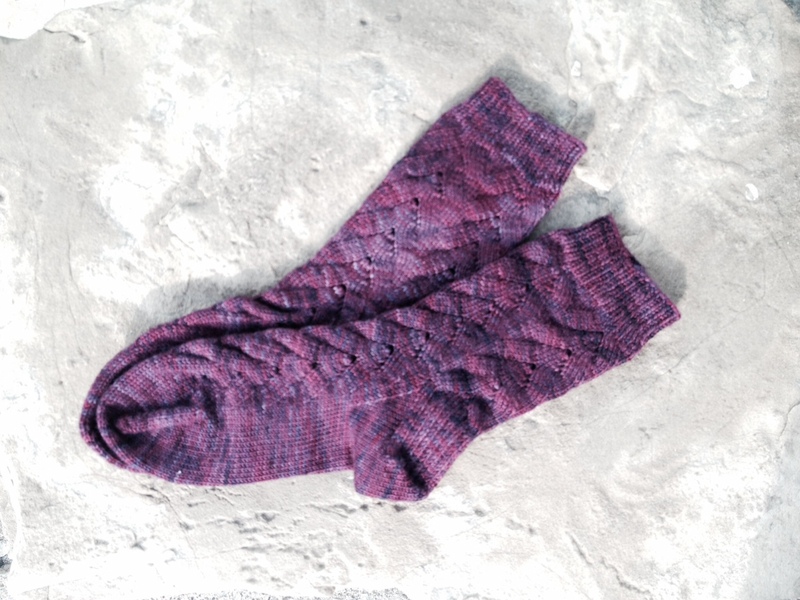 And while winter and spring came and went, these barely-partly knit socks sat and sat. A few weeks ago, the spirit moved me to haul them out of my WIP tote bag and start them up again. I have said it before and I will say it again; I don’t know what it is about this pattern but it practically knits itself. I completed the first leg on a Sunday afternoon, and the entire pair in under three weeks. If that’s not a record for me, it’s darned close. The colourway is named for a Buffy the Vampire Slayer character named Cordelia – the quote was one of many snarky ones for which Cordy was famous. It’s wonderfully variegated with several different purples running through it. One more pair to add to the pile for when autumn starts in earnest in a few weeks! Were There Changes Made To The Pattern? I don’t think so, but I knit them from memory so it’s possible. Would I Make Another? : I am sure I will…what can I say? I am a creature of habit. 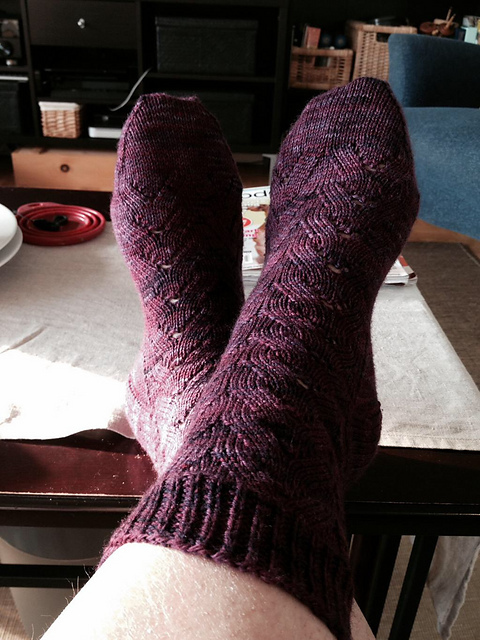 This entry was posted in Uncategorized and tagged cookie a., cordelia, fo, indigodragonfly, mcn sock, mergoat sock, monkey by Rayna. Bookmark the permalink. I knit those a couple of months ago, and I felt like they knitted up in seconds too! I also love the pattern recipe and use it all the time now!